Thousands of believers were in mourning Monday following the death of Gordon B. Hinckley, the humble head of the Mormon church who added millions of new members and labored long to burnish the faith's image as a world religion. An announcement of his successor was not expected for days. Hinckley, the 15th president of The Church of Jesus Christ of Latter-day Saints, died Sunday of complications arising from old age, church spokesman Mike Otterson said. He was 97. In a statement, President Bush praised Hinckley as a "deeply patriotic man." 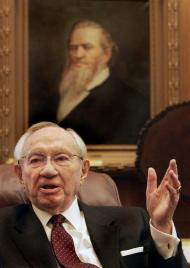 "While serving for over seven decades in the Church of Jesus Christ of Latter-day Saints, Gordon demonstrated the heart of a servant and the wisdom of a leader. He was a tireless worker and a talented communicator who was respected in his community and beloved by his congregation," Bush said. The church presidency is a lifetime position. Before Hinckley, the oldest church president was David O. McKay who was 96 when he died in 1970. Hinckley, a grandson of Mormon pioneers, was president for nearly 13 years. He took over as president and prophet on March 12, 1995, and oversaw one of the greatest periods of expansion in church history. The number of temples worldwide more than doubled, from 49 to more than 120 and church membership grew from about 9 million to about 13 million. Dozens of mourners gathered Sunday night outside Mormon church headquarters to honor Hinckley. College students sang hymns by the light of their cell phones. On Monday, Kelly Ford, 28, of Kaysville stared at a painting of Hinckley in the church visitor's center as a snowstorm swirled outside and recalled how he took time to speak to teens. "He was a complete optimist. ... He talked about our potential and what the Lord expects of us," Ford said. "He was the greatest optimist I've ever known." Hinckley became by far his church's most traveled leader in history. And the number of Mormons outside the United States surpassed that of American Mormons for the first time since the church, the most successful faith born in the United States, was founded in 1830. Hinckley worked to show that his faith was far removed from its peculiar and polygamous roots. Still, during his tenure, the Roman Catholic Church, Southern Baptist Convention and United Methodist Church — the three largest U.S. denominations — each declared that Mormon doctrines depart from mainstream Christianity. "The more people come to know us, the better they will understand us," Hinckley said in an interview with The Associated Press in late 2005. "We're a little different. We don't smoke. We don't drink. We do things in a little different way. That's not dishonorable. I believe that's to our credit." Republican Mitt Romney, who is trying to become the first Mormon elected president, said Monday he would miss the humility and wisdom of Hinckley and plans to attend his funeral. He also said Hinckley was pleased he was endeavoring to become the first Mormon elected president. "He smiled and said it would be a great experience if you won and a great experience if you lost," Romney said. Born June 23, 1910, in Salt Lake City, Hinckley graduated from the University of Utah with a degree in arts and planned to attend graduate school in journalism. Instead, a church mission took him to the British Isles. Upon his return, he became executive director of the newly formed Church Radio, Publicity, and Mission Literature Committee at $60 a month. Hinckley always worked for the church, except for a brief stint during World War II as a railroad agent. Hinckley was an apostle in 1978, when the church reversed its policy that prevented black men from holding the priesthood. He began his leadership role in 1995 by holding a rare news conference, citing growth and spreading the Mormon message as the church's main challenge heading into the 21st century. Hinckley's grandfather knew church founder Joseph Smith and followed leader Brigham Young west to the Great Salt Lake Basin. He often spoke of the Mormon heritage of pioneer sacrifice and its importance as a model for the modern church. By tradition, at a church president's death, the church's most senior apostle is ordained within days on a unanimous vote of the Council of the Twelve Apostles. The longest-serving apostle now is Thomas S. Monson, 80. The vote is not likely to occur until after Hinckley is laid to rest. At least twice in the past the naming of a new president has lagged for several years, but in modern times the announcement has come within a week. Monson, Hinckley's likely successor, was one of the youngest men ever called to the highest levels of church leadership, named a church apostle at age 36. 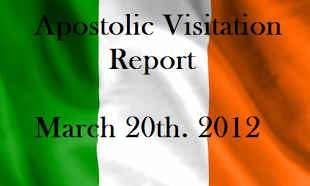 Before that he spent three years in Canada overseeing church missionary work. Prior to serving as Hinckley's First Counselor, Monson was Second Counselor to two previous presidents. A storyteller at heart, Monson in known among Mormons for his folksy humor, delivered in speeches and parable-like stories during the twice-yearly church conferences in Salt Lake City. He's also known for making frequent, unannounced visits to patients in local hospitals to offer encouragement and prayer. Outside the church his professional life included stints in newspaper advertising for the church-owned Deseret Morning News, later becoming general manager of the Deseret News Press, one of the West's largest commercial printing companies. I don't know if this will make it to the page, but I must say I appreciate the fact that you alowed the artical about President Hinckley to be posted. I am an LDS member, and I am greatful to find such a favorable artical on such a page. Thank you again.